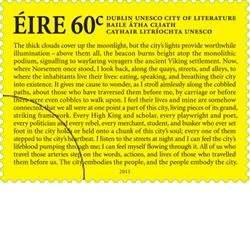 On 16 May 2013, An Post issued a stamp to commemorate Dublin UNESCO City of World Literature. When the city of Dublin was nominated UNESCO (United Nations Educational, Scientific and Cultural Organisation) City of Literature in July 2010, the capital of Ireland became just the fourth city to be honoured, following in the footsteps of Edinburgh, Scotland (2004), and Melbourne, Australia and Iowa City, USA (2008). This acknowledgement while most gratifying, was hardly surprising. Stop a stranger on the street almost anywhere in the world and ask which world city do they most associate with literature and chances are they will say Dublin. The city on the Liffey lays claim to no fewer than three Nobel Prize winners for Literature: George Bernard Shaw, W.B. Yeats and Samuel Beckett. Other literary luminaries who have called Dublin home include Jonathan Swift, Oscar Wilde, Sean O’Casey, Flann O’Brien, Brendan Behan and James Joyce. More recently, the list of Dublin-based scribes has lengthened considerably. The names of Roddy Doyle, John Banville, Anne Enright, Sebastian Barry and Joseph O’Connor have helped ensure that Dublin’s rich literary tradition continues to flourish. Authors abound in one of the world’s most literary cities. The UNESCO designation – which is on a permanent basis – recognises the quality, quantity and diversity of Dublin’s many excellent libraries, publishing houses and booksellers, as well as its world-acclaimed writers. Some of the other criteria for the designation include having literary-focused educational programmes, experience in staging literary events and festivals, the role played by literature in the urban environment, and the active involvement of the media in promoting literature and growing the market for literary products. To mark this milestone designation by UNESCO, An Post is issuing a new stamp designed by The Stone Twins and featuring a story about Dublin written by Eoin Moore.